Life purpose and vocation; I sometimes wonder how they are related. “What is my purpose in life?” I asked the void. “What if I told you that you fulfilled it when you took an extra hour to talk to that kid about his life?” said the voice. “Or when you paid for that young couple in that restaurant? Or when you saved that dog in traffic? Or when you tied your father’s shoes for him? Your problem is that you equate purpose with goal-based achievement. God or the Universe or morality isn’t interested in your achievements…just your heart. When I think about this concept of life purpose, I am relieved. I know and can live my purpose; it’s simple, direct and within reach. Yet, people spend years wondering if they’ve found and are living their life purpose. So, I wonder if what they are really wanting is a vocation, a calling, or a connection to their individual dharma as it is related to working in the world. If my life purpose is to choose “kindness, compassion and love”, I can do that in any line of work. It then becomes my responsibility to choose a line of work that aligns with my values, skills and abilities; a vocation that is of service to others and lights me up. I think THIS is what Stephen Cope means when he talks about dharma in The Great Work of your Life. We have a certain set of skills and abilities that are unique to us and it’s important that we contribute this uniqueness to the world. “We can’t be anyone we want to be” says Cope; we can only be our own unique collection of personality, skills and abilities. 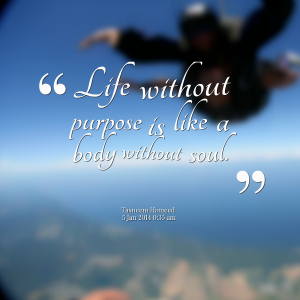 This doesn’t negate the idea of life purpose as described in the first quote. It simply expands it. We can choose kindness, compassion, and love AND choose a line of work that capitalizes on our strengths and personality. (our dharma). In fact, I might argue that in choosing both, we step firmly onto our dharma path. p.s. If you are a Southwestern College student questioning your purpose and/or dharma, come on by my office. I’m available for coaching and academic advising. Emilah is an adventurer, yogi, intuitive, energy healer, and ICF credentialed life coach. Having a long history working in Student Affairs, she currently serves in Admissions and Academic Advising at Southwestern College. Emilah is passionate about helping mid-life men and women live in greater alignment with their soul’s calling. You can also find her at www.emilah.com. She and her husband Jacob Gotwals, a recent SWC graduate, live in Santa Fe with their two cats and pup, Maisy.